To stand out in Melbourne’s home market, you need to showcase your property’s quality design and construction material. The stakes are high. The right choices make a “hot home” that sells quickly at a good price; the wrong choices result in low bids and long stays on the market listings. One of the most effective ways to highlight a home’s design and construction material is to install a mirror splashback. With the right application, this single design choice can optimise a home’s natural light, solve some of its troublesome design issues, and exhibit its high-quality material. To put it simply: Choosing this type of splashback can elevate your building project to a higher level. Take a look at the following benefits of this design feature and see if there’s an application for your next new construction or renovation job. You’ll most frequently find a mirror splashback for a kitchen behind the oven hob. It’s also effective in the space between the cabinets and countertop. Unlike regular mirrors, the glass used for the splashback is toughened through a rigorous heating and cooling process. The toughened glass ensures the splashback will withstand high heat and moisture, even from gas cooktops. There’s no need to worry about warping, cracking or shattering. In many kitchens, the window with the best view sits behind the sink while the oven hob goes on an adjoining or opposing wall. So, in this typical kitchen setup, the splashback requires lighting and decoration to improve its functionality and aesthetic. A mirror splashback, however, reflects the natural light streaming in from the sink window, as well as any other windows nearby. If those windows look out over valuable views, the mirror can double the effect, especially if placed on an opposing wall. Unlike a glass splashback, which has its own set of benefits, a mirror splashback elevates the effect of this desired layout. It also invites the other “rooms” in the open floor plan — such as the family room area or the dining area — into the kitchen, creating a more cohesive sense of design. Looking for a way to make a washroom or bathroom stand out? Installing a mirror splashback not only makes the bathroom space feel larger, but it can highlight many of the fixture and colour choices in the room. 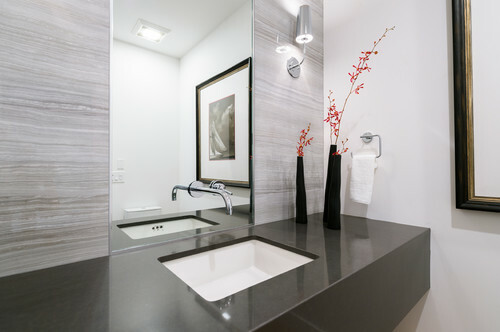 In addition, custom design and innovative techniques with mirrors can bring the splashback down to the bathroom sink countertop with the faucet fixture placed directly onto the glass. This creates a modern-style feature. The faucet feels like it’s floating over the bathroom sink. One workable, stylish daylighting solution: Install a mirror splashback. Because it reflects natural light, there’s less of a need to turn on energy-spending fixtures during the day. And since Australians spend more than 6 hours per week cooking in the kitchen, the pleasing nature of the light promotes health and helps regulate an occupant’s sleep-wake cycle. Tinted mirror splashbacks hide splatter well. Even when it comes time to clean, the splashback wipes down easily with glass cleaner or general cleaning agents to look as good as new. In addition, the panels can be fabricated into lengths of up to 3 metres, which means there are fewer seams for food and mould to hide in. Tip: Be sure to avoid abrasive cleaning materials such as metal or plastic scrubbers. They can scratch the glass and cause permanent damage. An antique mirrored splashback works well in a contemporary or traditional kitchen. The roughened, vintage style reduces glare compared to a completely reflective mirror, and adds a touch of charm. A smoked mirror splashback creates a grey tint to help accent cabinetry and countertop colour choices. Beyond kitchens, a mirror splashback feature can contemporize the traditional style of a home’s bar. For instance, a distressed effect adds texture and character to the space behind the sink. Thinking of using subway tiles as a splashback? Mirror tiles offer an eye-catching way to blend two popular trends. Beyond walls and windows, mirror splashbacks can be used to call out other features as well. For example, mirrored splashback kicker panels can highlight a home’s wood floors. Architects and interior designers have long used mirrors to optimize a home’s natural light. In many kitchens, however, there’s a challenge to bring natural light into dark wall spaces. The mirrors are easy to clean and hide splatter well. This design choice can also help accentuate fixtures in wet bars and bathrooms while adding brightness and spaciousness. Wherever you decide to install this unique feature, we can make it to exact measurements using laser equipment. The entire process is fully customised to our individual client needs to provide a truly unique, top-quality splashback without delays or long lead times. So contact us in Hoppers Crossing if you’re interested in installing a mirror splashback in your new construction or renovation project.